If you’re browsing around JibJab tonight, you may notice that our eCards and Everyday Fun sections have had a drastic new makeover! We’ve been working for months to apply new features to the site and now that they’re up, we’re excited to offer areas that will be updated on a daily basis, pointing out the latest and greatest content we’ve added to the site. Browse around, you’ll see a tour video, staff picks, our most viewed content, links to our various social networks and much more offered in a stylish new schematic. It’s our hope that JibJab will be a place you can stop by everyday to find something unique and awesome to send to your friends! This entry was written by paulhanges and posted on May 28, 2009 at 7:45 pm and filed under Fun with the Site with tags jibjab, redesign. Bookmark the permalink. Follow any comments here with the RSS feed for this post. Trackbacks are closed, but you can post a comment. Errrr, I dunno about having THAT Barry fella encourging folks to get a JibJab membership. I mean, after all, look at the load of crap he’s been selling us since that day in January! 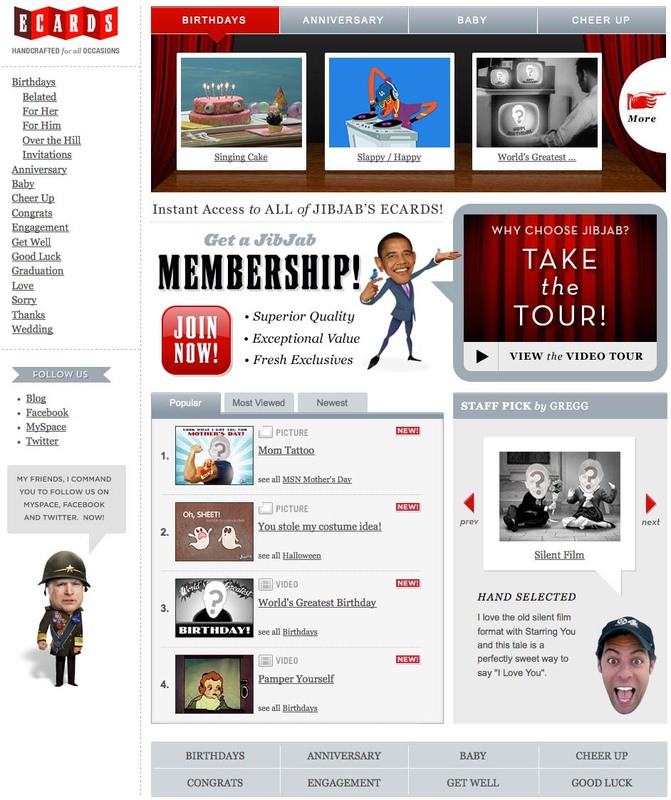 With the way things are going folks won’t be able to afford JibJab’s entertainment! the site will not load for me anymore..I made a ecard and put it on my facebook.. NOw when i go to the site it just keeps loading and reloading.. wot let me do anything..please help..
Hi Melissa – Check out this link for instructions on how to fix: http://jibjab.zendesk.com/entries/20219327-why-is-the-site-constantly-refreshing-or-reloading#overview. If your have more troubles please email us at help@jibjab.net. Thanks!